Preliminary results show six parties getting enough votes to enter the parliament, ruling coalition to be determined. Kyrgyzstan’s much-anticipated October 4 election looks set to usher in a new parliament with six parties (out of 14 on the ballot) earning enough votes to enter the 120-member body. Official preliminary results will be announced at 11 a.m. local time on October 5. As reported by 24.kg as of 10:30 p.m. local time the Social Democratic Party (SDPK) captured 27.47 percent of the vote, followed by Respublika-Ata Zhurt with 20.13 percent, Kyrgyzstan with 12.81 percent, Onuguu-Progress with 9.29, Bir Bol with 8.44 percent and Ata Meken with 7.74 percent. 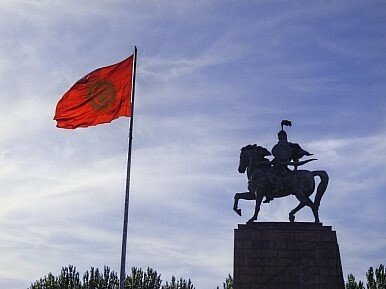 In order to enter parliament a party needed to obtain at least 7 percent of the nation-wide vote and at least 0.7 percent of the votes in each of Kyrgyzstan’s 7 regions, plus its two largest cities–Bishkek and Osh. Based on preliminary results, Kloop, a Kyrgyz news source, reported that SDPK would get 38 seats, Respublika-Ata Jurt 28 seats, Kyrgyzstan 18 seats, Onuguu-Progress 13 seats, Bir Bol 12 seats and Ata Meken 11 seats. SDPK was anticipated by many to come out on top in the election. Although when he assumed the presidency, Almazbek Atambayev, by law had to leave the SDPK–he is widely associated with the party regardless. Still, a coalition will need to be forged in order to form a government–none of the parties achieved a majority. It isn’t clear at this time how exactly that coalition will be shaped. The parties are not, as noted in previous reports, quite distinct with regard to their policy platforms. Eurasianet reported that elections officials recorded turnout at 4 p.m. local time at 37.9 percent, markedly low. But 24.kg’s 10:30 p.m. report cites the Central Elections Commission saying that final turnout was closer to 60 percent. For comparison, Kyrgyzstan’s last parliamentary election had a turnout of 56.59 percent of eligible voters and brought five parties into the parliament. SDPK (26 seats), Ar Namys (25), and Ata Meken (18) made up the latest ruling coalition, while Ata Zhurt (28) and Respublika (23) formed the opposition. The opposition parties merged ahead of the election and several members of various parties defected, sometimes oddly in an ideological sense, as well. IWPR reported in mid-September that two prominent members of Ata Meken, seen as “pro-Western” defected to Ar Namys, viewed as leaning toward Moscow. Another party that appears to have done poorly is Ar Namys, which despite holding 25 seats in the previous parliament did not earn more than 1 percent of the nationwide vote, according to 24.kg’s preliminary numbers. The election, according to most accounts, went procedurally well. RFE/RL reported that according to the CEC “automatic ballot boxes didn’t work in 52 out of the country’s 2,374 polling stations.” While some (including myself) worried that technical issues with the biometric registration system would cause problems on election day, mercifully it seems the technology worked (largely) as intended. The new Kyrgyz parliament is set to get to work next week, probably.